Use abcjesuslovesme.com. I’m sure there are other good websites out there, but this is truly amazing. There are so many things I love about this website. For one, it’s free. But for two, I love the balance between spiritual input and otherwise. 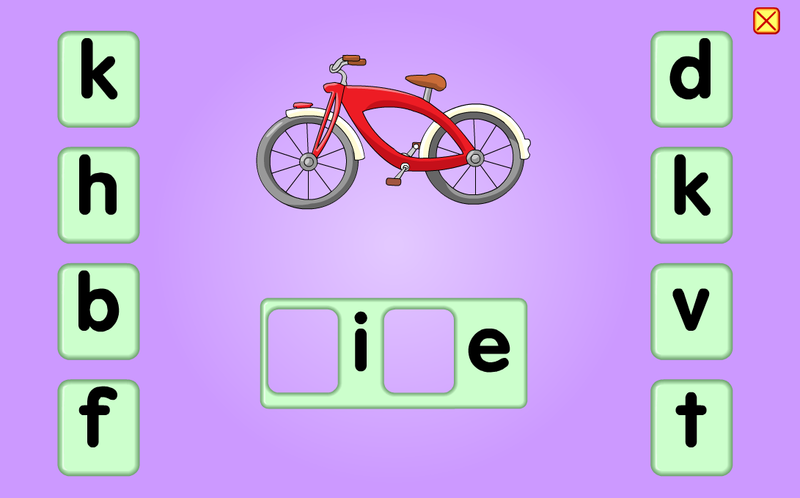 I love that it not only gives me a Bible story connected with life skills (this week Abraham & Sarah: patience), but they are also learning letters and numbers and shapes & patterns & fine and gross motor skills. Plan in Advance. I’m not talking weeks ahead, but I think it’s helpful at the start of every week, to get online, print off all you need & at least scan what’s ahead. Do it From Your Phone. I have wireless printing from my iPhone, so I just pull the website up on my phone and print off the week’s objectives. I’m also able to print her tracing paper & any necessary worksheets from my phone, which just makes everything so easy. Next, I pull up my library’s website & (again, from my phone!) put a hold on all the books for that month I need. That way, I can either take the girls and they’re all ready for us at the front desk, or I can have my husband stop and get them on his way home. I print these worksheets from my phone. 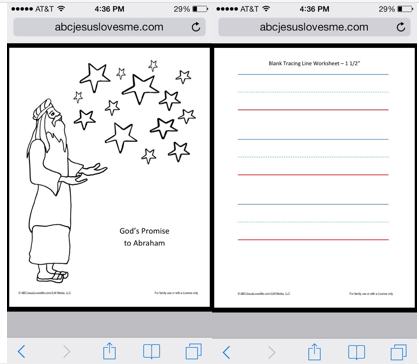 Left: Coloring worksheet from Abraham & Sarah lesson, Right: Tracing paper. Right now we’re working on L’s, F’s, E’s & the #4. 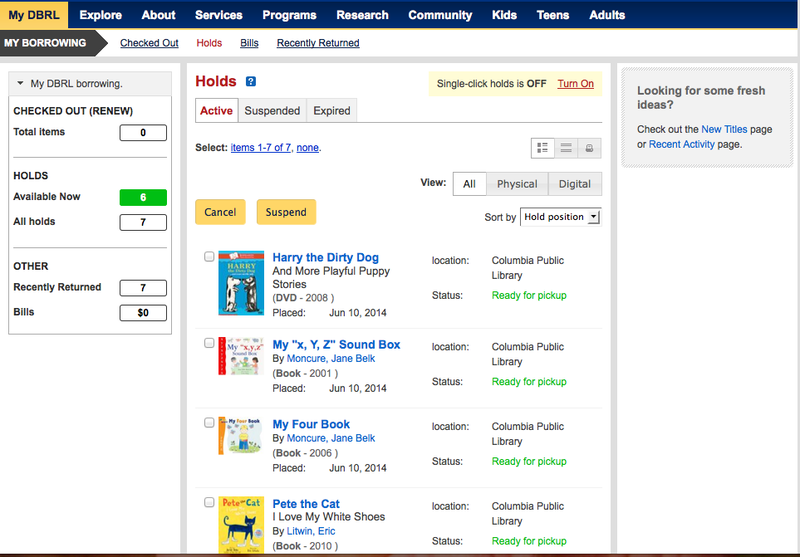 I copy & paste the titles of the books right into my library’s website, click HOLD & wahlah. Ready for pick up. Don’t Feel Like You Have to Do it All. I’m not even sure if you could- there’s so much on here. I just do a few days a week, so I pick my favorite crafts that seem doable. Or sometimes I’ll go in spurts. We did a ton this winter and spring, but now that it’s summer, we’re at the pool a lot. We’re still working through the lessons, but it’s not the focus right now. Be Resourceful. Initially you will want to get a bunch of basic stuff for crafts (paint, glue, pipe cleaners, glitter, etc). I have a bin full. But then you can start saving random things like toilet & paper towel rolls, egg cartons and oatmeal containers. A friend of mine once gave me a big bag full of those bright colored tops from those fruit & veggie sqeezables, saying she thought I could find a use for them. Sure enough, in the few weeks before Easter, several of the lessons included crafts involving caterpillars & butterflies for spring and to go along with the idea of Jesus’ resurrection (it was a bit of a stretch, but it worked). One of the fine motor activities involved lacing & it hit me- why not use some twine & have them lace those tops to make a Very Hungry Caterpillar?! It turned out awesome! The Very Hungry Caterpillar hanging from our rafters 🙂 We also made caterpillars from old egg cartons & butterflies using their feet and a paper towel roll. Use a Flannel Graph. Anyone out there remember these? Think 1970’s Sunday school classroom for the 4’s & 5’s. Apparently, they’re making a comeback. Or at least in my house. 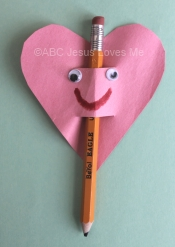 Abcjesuslovesme.com suggests using one alongside each lesson (I’m guessing most people don’t) so my mother-in-law happened to have one from years ago she gave us. Kids always feel more engaged with the story & learn better with props. It’s just a fact. Ginger, using the Jesus Story Book Bible and our flannelgraph to understand the story of Joseph (Genesis 37-45). Create a Messy Space. We have a small amount of unfinished storage space in our house that I’ve turned into our “craft room.” We have a kids table & chairs, all our art supplies & I laid down a tarp as well. The amazing thing about this space is that I never have to worry glitter or play dough crumbs (which I loathe) or messy hands. I keep a change of clothes for each of them down there and a box of wipes & paper towels to wipe their hands off before we come back upstairs. It takes away the barrier for me of not wanting to make a mess. If you don’t have a space like this, maybe just get a tarp you can set down or do whatever you need to so you can relax while your kids create. Kids also love it when you display they’re art because it shows you’re proud of them & what they’ve made. I hang up what they make (from church, too) on the walls, so it’s literally their art gallery. 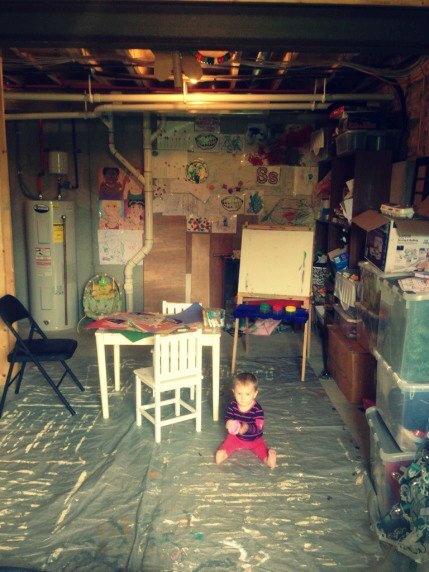 Our unfinished storage space turned into their craft room… and art gallery. If you don’t have an unfinished space you can use, put a towel down. Just LET THEM MAKE A MESS!!!! Use Appletv. For Christmas, my parents got us appletv. We didn’t have a smart tv, so for $99, you can attach this little black box to the back of your tv and it becomes wireless. What I like about appletv as opposed to a general smart tv (besides the fact that I can scroll my pictures to music as a screensaver), is that it syncs to your iphone- so you can do something called “mirroring” where you put your phone’s screen up on your tv. How is this related? There are amazing apps you can download on your phone- abcjesusloves.com recommends www.starfall.com (amazing) and I also really like abcmouse.com. Ginger (4) and Pearl (2) can be sitting next to each other on the couch and while Ginger is learning how to read, Pearl can easily watch and listen easily on the tv. Technology after all, is not of the devil; it’s a good thing in moderation. Kids today grow up knowing how to use an iphone before learning how to talk. It Takes a Village. This goes back to not feeling like you have to do it all. There are always occasions each month where we have babysitters, whether for small group or other ministry functions. During the school year, I have a babysitter that comes regularly and it dawned on me- why not have her read some of our library books with them or read a Bible story? Keep Perspective. You’ve heard it 1000 times, but it’s true: This is a short season. Your labor is not in vain. Get as much of God & His Word into their little minds and hearts now while they are young and impressionable. You can’t control whether or not they walk with God in the future, but you can set them up for success and till the soil of the hearts now. 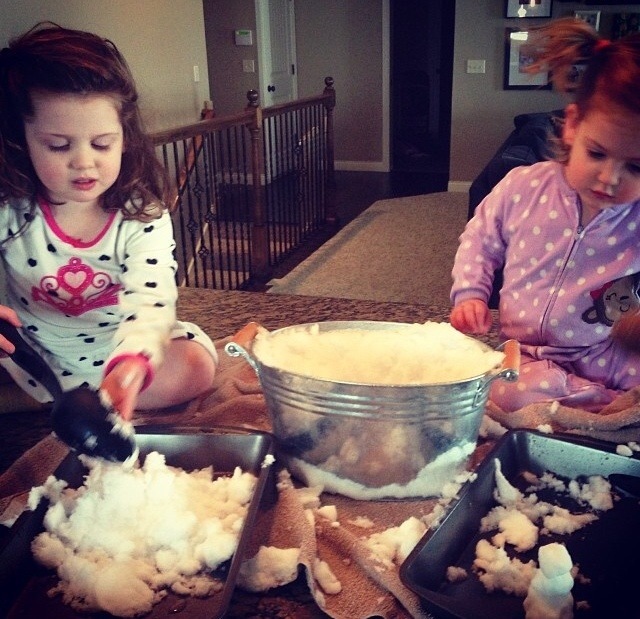 Plus, littles love any hands on time with you they can get. And like I said before, don’t feel like you have to do it all. Being hard on yourself or overly rigid or strict will lead to burnout. Give yourself grace and keep the bigger picture in mind. With God’s help, you can do it.